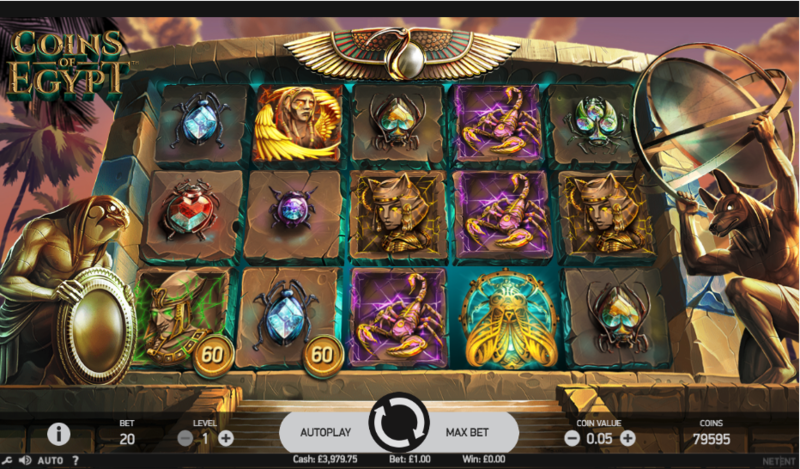 Ancient Egypt is a consistently entertaining destination for fans of online slot machines so one more to add to the mix is always welcome thing; this one’s called Coins of Egypt and it’s developed by Net Entertainment. Coins of Egypt is a five reel slot with three rows and twenty fixed paylines; those reels are comprised of blocks of stone and they spin within a large stone structure guarded on either side by statues of Ra on the left and Anubis on the right (please correct us if we’re wrong). Five striking characters represent the high value symbols and these seem to be a mixture of gods and astrological signs; bejewelled insects make up the lower values. The wild is another intricately designed insect which will replace all others to help form winning combos except for the Pharaoh Collect, the scatter and the seals (in the free spins round). During the base game you will notice that symbols with coin values appear on reels one, two and three; the coins are worth between 2x and 15x your bet. If a Pharaoh symbol lands on reel five you will be awarded the value of any coins in view as well as any combo wins. This is triggered by landing three of the scatter symbols anywhere in view on reels one, three and five; three chests (Ruby Eagle, Emerald Snake and Golden Cat) now appear below the reels and any coins in view are added to all three. Seals corresponding to each chest will appear on reel five and once three matching ones have landed and filled up the spaces in one chest, the round is over and your winnings are awarded, including the coins in that chest. Coins of Egypt is another extremely high quality slot from Net Entertainment which creates a gaming atmosphere a little different then most Egyptian-themed games; the features are inventive and there’s an RTP of 96.97%.